The 13th Forum on Responsible Mineral Supply Chains will take place from 23-25 April 2019 at the OECD Conference Centre in Paris. The Forum will feature sessions on measuring impact and driving change, opportunities and challenges related to specific minerals such as diamonds, base metals, cobalt, 3Ts and gold, and regulatory and policy updates related to responsible sourcing. Sourcemap CEO Leonardo Bonanni will highlight the various tools that are being used to authenticate (organic) food products e.g. fingerprinting, targeted analysis, non-targeted profiling, stable isotopes, etc. The aim of the Sustainable Fashion Research Agenda (SFRA) event is to take stock of the current state of affairs regarding sustainable fashion. In the last decade, numerous fashion brands, industry associations, and private consultancies have celebrated the concept of sustainable fashion. However, there is often an absence of concrete information about the actual progress towards sustainability. SFRA hopes to remedy this neglect by facilitating a research-based discussion on the current scale and scope of sustainable fashion initiatives. SFRA will focus on research-based presentations and active workshops focusing on what we actually know today about sustainable fashion, and particularly how SMEs can work strategically with sustainable fibers, circularity, or sustainable consumption. The event will thus provide holistic and knowledge-based inspiration about sustainable fashion that moves beyond the often limited and silo-like practices and logics of industry. The audience for SFRA is researchers, designers, brands, associations, NGOs, journalists and other reflective scholars/practitioners with a interest in sustainable fashion. The SFRA event is a collaboration between CBS and Design School Kolding. It is kindly supported by the Carlsberg Foundation and the Research Council of Norway as part of the project Future Ways of Working (275347) in the digital economy. SPLC’s annual Summit brings together 500 purchasing and sustainability professionals, suppliers, and NGO experts from diverse sectors and regions to share and promote sustainable purchasing best practices for organizations. The Summit’s expert-led sessions, networking, tradeshow, and buyer-supplier matchmaking are open to both members and non-members. A one-day conference focused on processes, practices, and tangible solutions and ways a fashion business can lead in climate change, environmental sustainability, and ethical responsibility. Digital Fashion Forum... a one-day conference focused digital and technology solutions so fashion businesses can become more competitive and lead in speed-to-market, data analytics, technology, transparency, and sustainability. Winning the customer war will highlight key channels and strategies that companies can use to attract and retain the modern customer. With the explosion of small brands, the rise of e-commerce, and the unprecedented levels of disruption across multiple product categories, consumer behaviors are shifting and channel landscapes are in flux. Join us to learn how the world’s leading retail and CPG companies are winning in this rapidly changing landscape. Sourcemap CEO Leonardo Bonanni is participating in the transparency panel, and Sourcemap will have a booth at the 2018 MIT Sloan Retail & Consumer Goods Conference. REMODE will curate a high-touch, informative and inspirational experience for established and upcoming fashion brands. Brand leaders, along with technology, manufacturing, raw material, media and service companies and investors, will come together to share innovative ideas, find practical solutions and forge new connections. We are proud to launch this event in Los Angeles, CA – a growing creative center for the renewable fashion industry. Sourcemap Founder & CEO Leonardo Bonanni will be speaking at the Harvard Business Review Summit in Mexico City at IPADE Business School on October 9. Sourcemap's Yining Shi is giving a live lecture and demonstration of how to train a "Style Transfer Model" using Spell - you can watch it on Youtube here! With the explosion of “Fast Fashion”, the industry has been facing increased scrutiny. Our clothing is often made in an unethical manner, rife with human rights abuses throughout the supply chain, ranging from forced labor to inhumane work conditions. Emerging technology is increasingly seen as a way to create transparency in this supply chain, and secure the rights of fashion workers. This panel will discuss the way that technology, ranging from AI to Blockchain, might be leveraged to create a more sustainable fashion industry. Sourcemap's Alex Dovzhanyn is presenting his blockchain work at ElixirConf, the premier conference for the Elixir community where Elixir developers from around the world gather. Sourcemap will be presenting at the RILA's semi-annual sustainability meeting in New York City August 1st, 2018. Sourcemap CEO Leonardo Bonanni will be presenting at P&G Signal in Cincinnati. This high-powered event will provide an introduction to supply chain mapping and how it is transforming global business relationships towards greater dynamism, growth and sustainability. 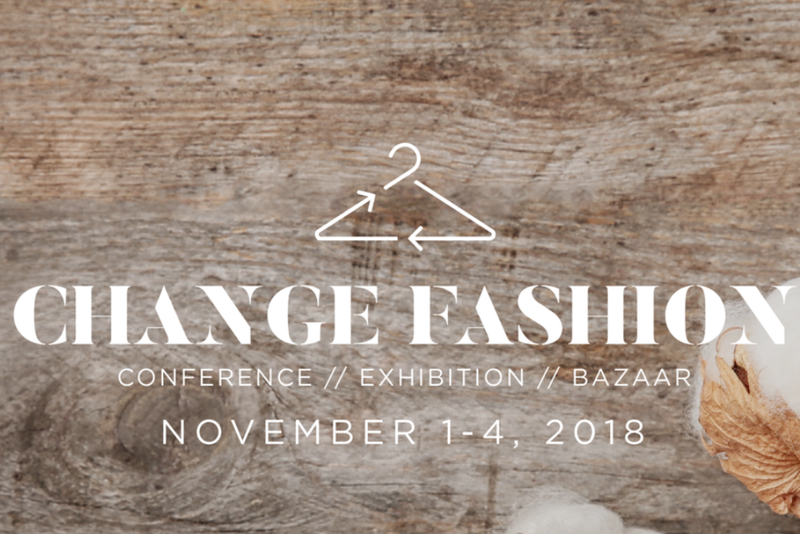 The Change Fashion Challenge (CFC) focuses on creating innovation to pioneer the future of fashion and create a new sustainable ecosystem in the fashion industry. This means innovation throughout the entire product lifecycle, toward a circular and regenerative model -- changing the way garments are designed and produced, shipped, bought, used and recycled by introducing disruptive science and technology and new business models. The Change Fashion Forum and Workshop is an invitation-only event bringing together leaders from the fashion industry, academia, and non-profit organizations to begin the development of a prioritized sustainable fashion research agenda and roadmaps for the priority areas identified in the agenda. The AIARD 2018 Annual Conference will focus on issues at the interface of agriculture, food and nutrition and their impact on human health. Challenges facing all societies in this agro-economic space require solutions that are interdisciplinary in nature, based on a food systems approach, and that bring about positive socio-economic transformation. We will combine our exploration of technical interventions, cultural factors, behavior change communication, and the key role of policy development both in the U.S. and abroad. This multifaceted discussion will enable the conference attendees to develop a sound understanding of how, by working together, we can generate the stimulus needed for sound decision making and improvements in human health worldwide. The 2018 Oslo Freedom Forum (OFF) marks the 10th anniversary of a unique gathering of the world's bravest human rights activists with creative entrepreneurs, intrepid reporters, cutting-edge technologists, and bold artists, united by their commitment to making today's world more peaceful, prosperous, and free. OFF has evolved from an annual human rights event into a thriving international community with satellite events in cities like New York and San Francisco. The 2018 Oslo Freedom Forum will feature even more powerful stories of courage, struggle, perseverance, and resilience in the face of tyranny. We will celebrate the real-life heroes who have become an essential global human rights community that has broken barriers between nations and united activists in the struggle for freedom. Unthinkable a few short years ago, supply chain transparency has become business-as-usual for industries ranging from food to fashion and electronics. The motivations go far beyond marketing: transparency has emerged as an essential business process for ensuring that supply chains are as efficient as can be while avoiding short-term disruptions and ensuring long-term sustainability. A rapid shift is underway in how brands and manufacturers communicate with their supply chains, and new rules of engagement are emerging that favor transparency and data-rich approaches to sourcing. This latest Alliance Pipeline seminar will provide a real-world perspective on how this transformation occurred, including case studies of the motivations, benefits and implementation challenges to implement transparency. Sourcemap will be attending the 2018 Member Meeting of the Sustainable Apparel Coalition. A nonprofit forum dedicated to creating Latin American solutions to the apparel industry’s global problems across every sector of production: because interdisciplinary collaboration and action is fundamental to secure an equitable and sustainable future. REACT joins the Fashion Week realm with the purpose of generating more tools to develop the local industry, generating alliances and joint strategies between different sectors and agents of national and international change to strengthen the Costa Rican product through innovation, managing to create profitable, sustainable and purposeful ventures. On 20 March 2018, in Milan, Camera Nazionale della Moda Italiana will be holding the 2nd International Roundtable on Sustainability, an event designed for international luxury brand CSR managers. The initiative is one of several organized by the Sustainability Committee and Sustainability Work Group co-ordinated by CNMI to provide a forum for discussion and training on sustainability issues in the luxury fashion industry. The agenda features contributions from experts in this segment and conferences on specific themes. The 1st edition (28 March 2017) was attended by high-profile personalities from numerous major Italian and international brands. The proceedings were opened by CNMI president Carlo Capasa, who illustrated results achieved and new objectives on the CNMI Sustainability Roadmap, completion of which is scheduled for 2020. The morning programme also included an interview of Livia Firth and Simon Evans from the UK consultancy Eco-Age by Lucy Siegle. CNMI held three roundtable sessions on themes it has studied in depth in recent years: “The chemical issue” (moderated by Mauro Rossetti, director of Associazione Tessile e Salute), “Sustainable Retail: how and why” (moderated by Isabella Goldmann, Managing Partner, Goldmann&Partners) and “Activating and communicating sustainability and supply chain shift” (moderated by The Guardian journalist Lucy Siegle). The event provided a highly useful sharing of participants’ objectives and activities and enabled CNMI to present its own important and innovative objectives/achievements through its Sustainability Work Group and Sustainability Committee. AIM-PROGRESS is a forum of leading Fast Moving Consumer Goods (FMCG) manufacturers and common suppliers, assembled to enable and promote responsible sourcing practices and sustainable supply chains. It is a global initiative supported and sponsored by AIM in Europe and GMA in North America.